Neil Young News: An Evening With Neil Young as 'Human Highway' Goes Nationwide! Global Next?! An Evening With Neil Young as 'Human Highway' Goes Nationwide! Global Next?! 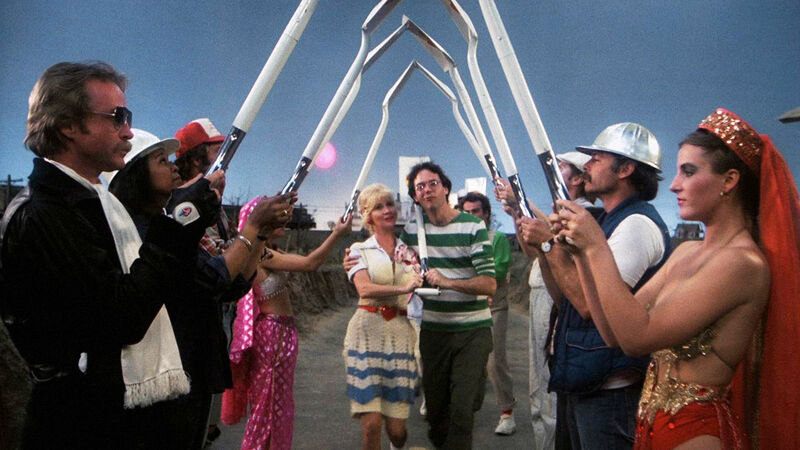 Neil Young's cult classic film Human Highway will be released to theatres on February 29th. Not only that, but it will be a double feature with the film Rust Never Sleeps and a Q&A with Neil Young and Human Highway cast members Charlotte Stewart, Russ Tamblyn and Devo's Gerald Casale conducted by Cameron Crowe. Ticketing: Tickets will be available to the general public Friday, January 15. John Rubey, Fathom Events CEO, said, "We are proud to present 'An Evening With Neil Young' to fans across the nation. Music lovers will get a unique opportunity to experience over three-and-a-half hours of landmark rock n' roll entertainment from one of music's most beloved singer-songwriters." "Neil Young is a singular talent and an icon of American popular music, and we are proud and honored to support this event, knowing full well how much our members will enjoy it," said Robert Love, editor in chief of AARP The Magazine. "I have many fond memories of seeing Neil and Crazy Horse at the Fillmore East in New York City, solo at Carnegie Hall, and have followed his career since Buffalo Springfield." "When Love and Fate Collide"
Here's the film trailer for Human Highway. As we blogged in 2014, Neil Young's film Human Highway had the director's cut version première at Toronto International Film Festival | TIFF.net in September. 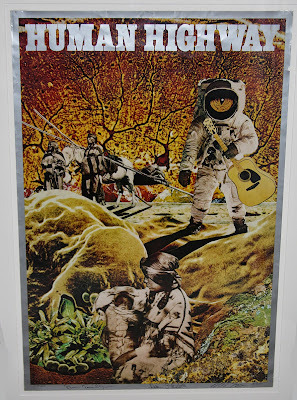 "Neil Young's mind-bending 1982 post-apocalyptic musical comedy, in which the rock legend writes, directs and stars alongside an eclectic and eccentric cast including Dean Stockwell, Russ Tamblyn, Dennis Hopper and Devo." 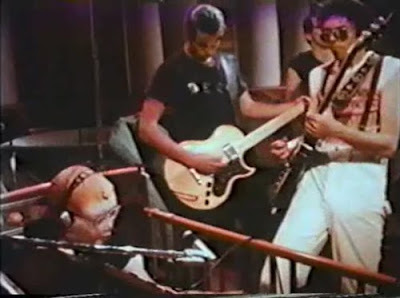 "We were kind of repulsed by the whole experience," Devo's Mark Mothersbaugh told Rolling Stone in 2010. 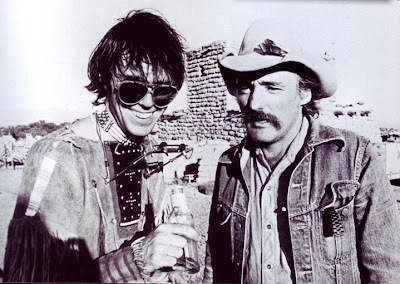 "I thought Dennis Hopper was retarded when we met. He couldn't say his lines. He couldn't speak a sentence. He just ignored every direction he got. He was a short-order cook in the movie and he was playing with a knife and he ended up cutting Sally Kirkland really bad. She ended up suing Neil Young." Mothersbaugh says the film has grown on him over the years. "At the time, we discounted it, but 10 years ago, I went to some arts cinema and saw it again," he said. "I liked it more in retrospect. Devo actually has some of the best parts of the movie. It's a truly weird piece of history." 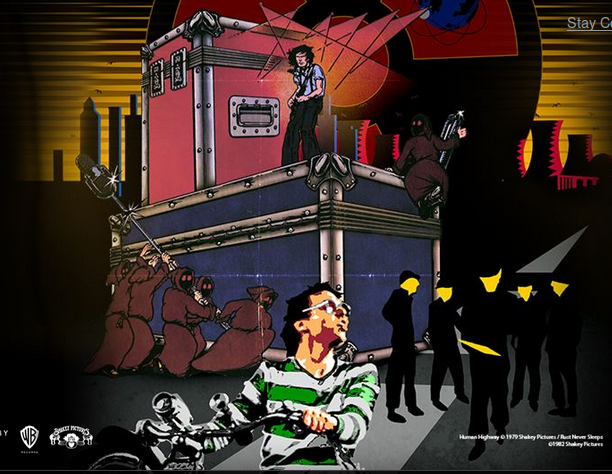 The 1982 film Human Highway by Neil Young portrays the Earth's last day following a nuclear holocaust. Original movie posters referred to it as a "nuclear comedy" and filming began soon after the Three Mile Island nuclear accident and continued over four years with Young spending $3,000,000 of his own money on production (source). The film is considered a cult classic somewhat similar to the legendary Journey Through the Past and has been described as "if David Lynch directed "The Wizard of Oz on acid." "It's so bad, it's going to be huge" proudly declared the poster . Neil Young's 1982 comic mess of a feature left many faithful fans baffled and was otherwise unappreciated at the time of its release. But with the benefit of hindsight and shifts in pop culture in the last couple of decades, much of Human Highway now feels warm and funny where it once looked disastrously undisciplined. The plot revolves around a small gas station-diner in a fictional town next to a nuclear power plant. A choreographed musical dream sequence takes place as the nuclear blast occurs. At the destroyed gas station-diner post nuclear holocaust Booji Boy (DEVO's Mark Mothersbaugh) is a lone survivor. 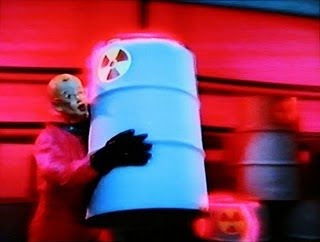 At the nuclear power plant, trash collectors (members of DEVO) reveal that radioactive waste is routinely mishandled and dumped at the nearby town of Linear Valley. They sing a remake of "Worried Man Blues" while loading waste barrels on an old truck. There's a leak at the power plant and "Barrel go boom," as the power plant worker so succinctly puts it. A character's (Otto) recent death is by radiation poisoning. I don't know what's going on in the world these days. It seems that everybody's just got everything turned around. People don't seem to care about their fellow man. They're all going for that big ice-cream cone in the sky! They haven't figured out what happens when your eyes get bigger then your belly. Like an ostrich who eats his pizza with his head stuck in the sand. If they can't see it, it isn't there. And you know, it really *does* take a worried man! More on Neil Young Films. Also, see Human Highway on Amazon . Thrasher's Wheat is pleased to bring our readers an exclusive Q&A session with a member of Neil Young's Shakey Pictures crew who worked on the research, editing and meticulous restoration under the supervision of Director Bernard Shakey. 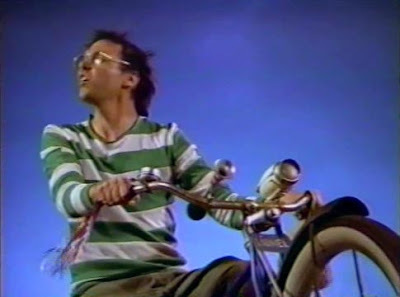 Neil Young's 1982 post-apocalyptic musical comedy, has long been out of circulation and is regarded as a cult classic with its mythical history of production mayhem, post-production chaos and forgotten legacy. Now, 32 years after Human Highways' first screening, Bernard Shakey's crew is ready to answer a few questions. Thrasher's Wheat - The film Human Highway is considered to be a cult classic somewhat similar to the legendary Journey Through the Past and has been described as "if David Lynch directed "The Wizard of Oz on acid." What surprised you going back to the footage shot back in late 70's? Shakey Pictures - Maybe not so much surprising, but very noticeable was how well shot the film was under the direction of David Myers. TW - So what prompted the desire to produce a director's cut version of Human Highway? SP - The version that was first screened at the Mill Valley Film Festival in 1982 really could be considered the Director’s Cut. Time went on and various edits of the film had their moment in the sun, but Mr Shakey still held onto his original vision. Along with Producer L.A Johnson, he dispatched the Shakey Pictures crew to locate, catalog and collect for assembly all the original footage that had been cut out of Human Highway post- Mill Valley. It was a lengthy undertaking. TW - The original release of Human Highway was 88 minutes. The director's cut version is 80 minutes. Usually these director's cut versions go to longer side not shorter. Is this tweaking/ shortening up longer scenes or scenes removed? SP - That is correct. Once the 1982 Director’s Cut was reassembled, Bernard oversaw further refinements to the story. An astute viewer will note that while the running time of the movie is shorter than that on VHS, there are actually some new elements in the final presentation that will be screened at TIFF. TW - Was this filmed in 35mm? SP - Human Highway was shot in both 35mm and in 16mm film. TW - What are we looking at now? Film edited on high resolution digital video? SP - The Shakey Pictures team found and transferred the oiginal negatives of the film footage, which then underwent extensive restoration and cleaning, frame by frame. Editing was in high resolution digital. TW - What is the sound format resolution compared to original? SP - The sound quality is much improved over the original. The same attention to detail that was given to picture was also given to audio on this project. The film’s original master 16 track analog tapes were transferred at 24 bit/ 192kHz, as well as the original dialog and music reels. The new mix of Human Highway is now presented in 5.1 surround as well as in stereo. TW - What are the release format plans? Blu-ray? SP - After Human Highway’s theatrical run, it would be fair to say that you can expect to to see Blu-ray and DVD releases. TW - We know folks would love to hear the story of Woody, the wooden Indian and his mates. Were they really burned in the desert? Is Woody, the wooden Indian, we've seen recently onstage with Neil the same? A survivor? SP - Yes, that is indeed Woody in the film. He has some scenes in the garage at Otto’s Corner. I don’t know his back story or what stock he came from, but do know that Woody embodies the strong silent type. That is well depicted in Human Highway. TW - Will there be a director's cut video release with "special features"? Like a vinyl album soundtrack, a booklet, deleted scenes, 'making of' documentaries, etc? SP - It’s a bit too early to reveal what comes next out of the Shakey Pictures archives in relation to Human Highway, but there is definitely some stuff in the vaults. Human Highway (Director's Cut) Clip 1 from Shakey Pictures on Vimeo. Human Highway (Director's Cut) Clip 2 from Shakey Pictures on Vimeo. More at Shakey Pictures - Human Highway. Sounds innaresting, but I'm not too sure about the commercial viability of this. This would seem to appeal to a very niche market from within a niche market, but we'll see. *Is the Q&A session with Cameron Crowe pre-recorded? Generally, Q&A sessions are live, but the press release seems a little unclear to me. *Is Rust Never Sleeps being shown in Rust-O-Vision? *Which movie is being shown first? If it's Human Highway, some unwitting people may not have the patience for it and could potentially walk out. Neither of the films are great cinematic achievements, but Human Highway is quite extreme in the so bad it's good category, but you certainly have to be in the right frame of mind to enjoy/tolerate it. On the other end of the spectrum, Rust Never Sleeps is just a very basic concert film (especially without Rust-O-Vision). While the music is great, there are also moments of tedium that don't translate too well to the big screen experience (without being able to hit the fast forward button). That being said, if this presentation shows up in the Balto/DC area, I'll definitely be there with my popcorn ready. "I went to the movie(s) the other night; the plot was groovy, it was outta sight"
Just saw the details, sorry, should have checked first. *It's showing in a ton of theaters. Seems like way too many for what I perceive the demand to be, but I trust they did their due diligence. **Looks like Human Highway is being shown first. ***Looks like it is a live Q&A session, but I'm still unclear how the mechanics are supposed to work. Will each showing have the ability to ask questions, or just be able to view the live session? ****No mention of Rust-O-Vision, but I'll bring my Rust glasses just in case! Good Q's TDaze. And HNY to you and good to see you again. We understand the Q&A is a live event on East Coast. West Cost gets a replay. So lucky us in DC/Balto area. :) Which theatre for you? And it would be cool if RustOVision. We'll bring our Rust-O-Vision glasses also. We've got our popcorn ready and we'll see you at the Motion Pictures! My dad and I are buying tickets now. He'll probably think Human Highway is stupid, but he loves RNS. The I wonder how they will live stream the interview... Regardless, I hope they give out Rust-O-Vision glasses! You make a very good suggestion when you say "Global Next". If you've got a line into Shakey Pictures could you put the bug in their ear? Otherwise those of us "up in T.O." are going to have to make the drive down the QEW to Buffalo to catch this. Sounds awesome though! @Tom - yeah, strange no Canadian screenings. Not that we really have any particular insight, but every large media deal requires separate negotiations with each country (exchange rates, etc.). Maybe they just couldn't swing it? who knows? that said, we would bet major Canadian cities get added in coming weeks. I'm thinking the show for me will be the one in Hanover (Arundel Mills), unless it turns out I have to be out of town for work. Which theater for you? If Hanover, I'd be happy to meet and treat you to a drink and even some popcorn! You've earned that and much, much more.. Thanks TDaze. Mighty gracious of you and appreciated. enjoy the popcorn. So if you get to ask a question of Bernard, what will it be? We're pondering a question as well. We've always wanted to know whether the nom de plume Bernard Shakey was really from Neil's early camera work, which was... at best, shakey, because he refused to use a tripod preferring the realism of hand held. Didn't realize there was a showing in DC. It's fine with me, though I hate the hassle and traffic! Give me the burbs any day..
* What's the last song you wrote that you're most proud of or means something special to you? * Who was the Cinnamon girl and really, what exactly is a Cinnamon girl (or for that matter, A Cowgirl in the Sand)? * Do you have any unique movie plans in the near future (other than live performances), or any plans to act? Maybe Meryl Streep could assist..
* May be a little touchy, sorry, but with your recent life changes do you foresee any changes to the Bridge school or the annual concerts, etc? * Why didn't Rust-O-Vision become more popular? * Any regrets selling some of your real estate holdings, or has it freed you up in a lot of ways? * Personally, I think your version of Like a Hurricane from the Live in Berlin concert is the best I've seen or heard. Agree, disagree, or don't care? * For Neil & Cameron: Any plans to collaborate on a movie? * For Cameron: I recently read that you had initially planned to use a live acoustic version of "On the Way Home" from the Massey Hall era to end your movie Almost Famous. Why'd you scrap those plans? I've always appreciated your use of Neil songs in your movies, but have found many of the selections slightly out of place and not central to the plot. * Also, how's that book on Neil coming? I read that you've recently done some more exhaustive interviews, though they may be used as liner notes for Archives 2. * Neil: If you had to put any one item in a time capsule that best describes you, or your music, or feelings about music, what would it be? * Any thoughts of reviving the potential idea of a broadway play for Tonight's the Night? How about a movie version? Or the After the Goldrush movie as initially scripted? Well, those are just a few that came to mind. Tomorrow I'll have another batch a little more thought out! Lots of good Q's there TDaze. But it's a safe bet that they're looking for HH & RNS related Q's. That said, your last Q is a good one tho. Altho it's likely that NY wouldn't have an answer. Hey someone tell Neil he has a few days between the Marseille and Toulouse gigs next summer to pop into the Midnight Sun Film Festival up in the Arctic Circle to do a showing of Human Highway! Is there an ETA for the Lincvolt movie in the works? I attended "An Evening with Neil Young" on Feb 29. The movie was fun, the Q & A was fantastic however the concert ended mid-song because the live feed was cut short by 27 minutes! Unbelievable. Theater personnel said 'there is nothing we can do; Fandango takes no responsibility and the event organizer Fathom Events offers their "sincere apologies". What a disaster.